I'M AT THE END OF MY GM LEASE, WHAT DO I DO? The end of your lease term doesn’t have to mean the end of your driving experience in a GM vehicle. Options await as you decide on your next steps in the leasing process. Let us help guide you through your End-of-Lease process. 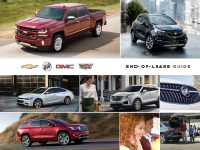 From communicating to you before your term is due, to the turn-in and inspection processes, to your options once your lease has expired, NewRoads Chevrolet Cadillac Buick GMC is with you every step of the way. From getting behind the wheel of a brand new GM vehicle to purchasing your lease, learn what choices you have as your end-of-term date nears. Need to set up a vehicle inspection for your lease but not sure how to start? Not to worry, we have you covered with a convenient vehicle inspection process. The vehicle inspection will determine the existence of any billable Excess Wear and Use charges under the standards defined in your lease agreement.